. Kyoto Folk Art - 京都（府） .
. dorei どれい【土鈴】 clay bells . Clay bells started of as toys and amulets for children, but since the Meiji period they came to be a well-loved souvenir. 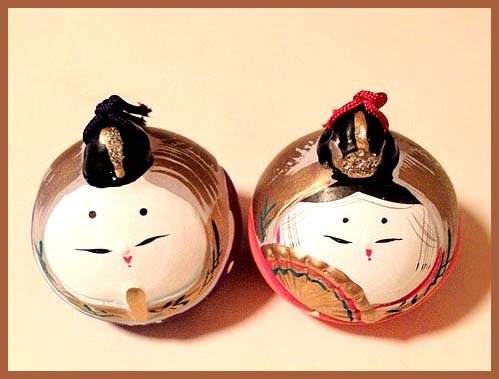 A lot of the clay bells come from the Kyoto area.
. Kyoto Folk Art - 京都民芸 . Most of the many temples and shrines have their own special clay bells as amulets. The following will be introduced below.
. Choorakuji 長楽寺 Choraku-Ji .
. Hoorinji 法輪寺 Horin-Ji "Daruma Temple" .
. Fushimi Inari 伏見稲荷 Fushimi Inari Fox Shrine. They are colorless and rather small, with a diameter of 4 cm. They come in a group of 5 or ten, bound with a string of hemp. In former times people hung them in the branches of fruit trees to protect the fruit. 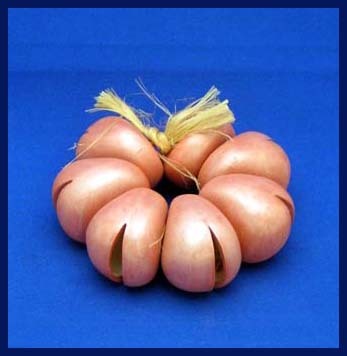 Or hanging them into a well would keep the water sprouting. 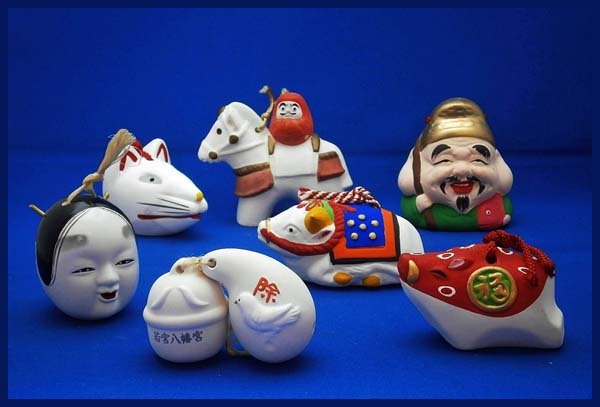 to get a stamp at each shrine or temple and a clay bell of the zodiac animal of the year. from the 1st to the 15th of January. 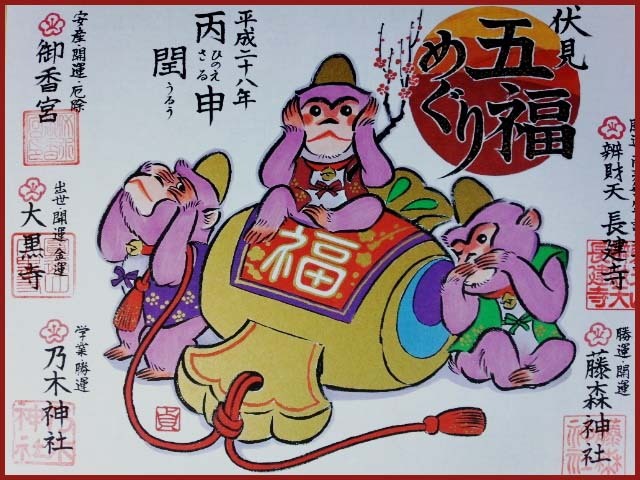 This is a special New Year's event to collect red stamps and pray for good luck while touring the following five shrines and temples: Gokonomiya Shrine, Fujinomori Shrine, Chokenji Temple, Daikokuji Temple and Nogi Shrine, in Fushimi Ward, Kyoto. It is sponsored by "Rakunan Hoshokai,"
an association consisting of shrines and temples in the Fushimi area. Visitors purchase a fancy cardboard with one red stamp and a picture of a tiger, the oriental zodiac sign of 2010, for 1,000 yen at the first shrine or temple they visit. They collect the other four stamps for 300 yen each at the other locations, and "Dorei," or a clay bell, in the shape of a tiger is given when all five stamps have been successfully collected.
. Heian Jinguu 平安神宮 Heian Jingu Shrine .
. kanju manju no suzu 干珠満珠の鈴 clay bells of ebb and tide . Azumi no Isora 阿曇磯良 holds the Tide Jewels, an expression of his superior understanding of the sea. 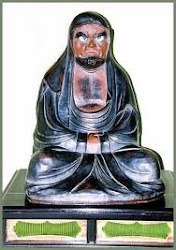 His ancestor is the deity Wadatsumi no Kami 少童命 / 綿津見神.
. Kibune Jinja 貴船神事 Kifune Shrine - Kurama . A play of words with the name of the shrine, 黄船 "yellow boat".
. Kitano Tenmangu 北野天満宮 .
. Marishi Sonten Doo 摩利支尊天堂 Marishi Hall .
. Senbon Shakado 千本釈迦堂, Daiho-Onji 大報恩寺 .
. Shinnyodoo 真如堂 Shinnyo-Do .
. Shusse Inari Jinja 出世稲荷神社 Shrine .
. Wakamiya Hachimangu 若宮八幡宮 Kyoto . Two legends about clay bells! there were 土鈴 clay bells with a Japanese dace with only one eye and 土偶 small clay statues of Kamakura Gongoro. Gongoro lost his right eye by a hit with an arrow during the siege and 後三年の役 "Later three year's war" of Kanezawa (around 1086 - 89). Gongoro was just 16 years at that time. He pulled out the arrow at the river 厨川 Kuriyagawa wna washed his wound there, thus polluting the river. Now the fish in the river have only one eye. The clay figures and bells depict him and 石斑魚の土鈴 the Ugui river fish with only one eye.
. ugui 石斑魚 Japanese dace .
. Kamakura Gongorō Kagemasa 鎌倉権五郎景政 . mushikirisuzu 蟲切鈴 clay bell "to cut away insects"
. Kanazakura Jinja 金櫻神社 / 金桜神社 Kofu .